Dr. Vyakarnam is an innovator in medical devices, drug-device combination products and biomaterials. Founded VYTAL Group and he is passionate about translating advances in research to transformative products through consulting and ventures. Previously he headed Global R&D - Medical Devices and Pharma Solutions for the newly created Lubrizol Lifesciences business unit (A Berkshire Hathaway Co). Prior to that he was at Johnson & Johnson for nearly seventeen years and most recently as Director R&D at Advanced Technologies & Regenerative Medicine. He directed research and was responsible for several product development projects leading to successful product launches or clinical trials for J&J operating companies - Ethicon, Ethicon-Endo Surgery, DePuy and Cordis. 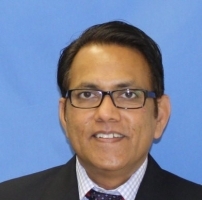 Dr. Vyakarnam is an inventor of over 35 US issued patents/ applications and received numerous awards including Johnson & Johnson’s Philip B. Hofmann Award for Scientific Excellence.